What causes adenosine build up in the brain when awake? However, I am wondering what specifically causes this adenosine build up. 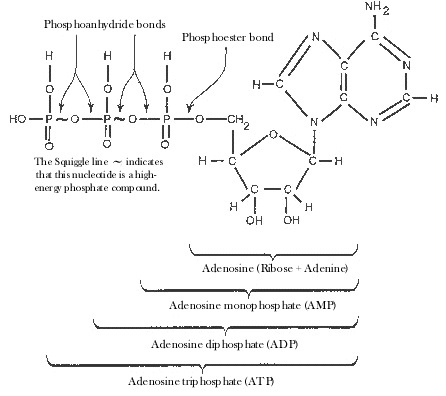 I understand ATP (adenosine tri-phosphate) is broken down to ADP in the brain to produce energy. I thought this ADP would then be used to re-generate ATP again etc, so I'm not sure how adenosine is built up in the brain over a day. Basically I am unsure how Adenosine itself, as opposed to ATP or ADP, is produced during the waking state? My theory is that during the high demand waking state there is insufficient energy to convert ADP back to ATP, and the excess ADP is broken down to adenosine somehow. I would appreciate an explanation of how this build up occurs, and also an explanation of how this in turn how it induces sleepiness would be a plus. Adenosine causes humans to become sleepy. But how ? During day time we consume food which is broken down into glucose. This glucose is broken down by "Glycolysis" in cell's cytoplasm during which ATP is produced. This produced ATP is is then used by body as an energy supplier. ATP breaks down into ADP and then AMP with the release of energy which our body consumes for doing work. Adenosine is produced continuously and starts to accumulate around and in Adenosine receptors such as A1, A2a, A2b and A3 (as shown in fig below).Adenosine inhibit signal propagation and energy production in at least A1. (Not all the receptors induce sleep when they receive Adenosine.) "A1 receptor" receives adenosine and induces sleep. A1 receptors are implicated in sleep promotion by inhibiting wake-promoting cholinergic neurons in the basal forebrain. Continuous inhibition of A1 receptor by Adenosine slowly induces sleep by relaxing the brain and muscles but without substantially weakening their abilities! How is Adenosine metabolized ? 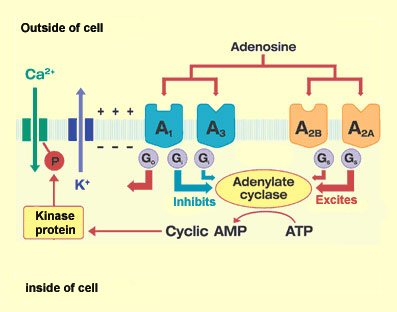 During sleep the accumulated Adenosine is metabolized by Adenosine deaminase enzyme which catalyzes the irreversible deamination of 2'-deoxyadenosine and adenosine to deoxyinosine and inosine. With the reduction in the Adenosine content the body is excited from sleep slowly. The accumulation of adenosine during waking periods is thus associated with the depletion of the ATP reserves stored as glycogen in the brain. The increased adenosine levels trigger non-REM sleep, during which the brain is less active, thus placing it in a recovery phase that is absolutely essential—among other things, to let it rebuild its stores of glycogen. Because adenosine is continuously metabolized by the enzyme adenosine desaminase, the decline in adenosine production during sleep quickly causes a general decline in adenosine concentrations in the brain, eventually producing conditions more favourable to awakening. Not the answer you're looking for? Browse other questions tagged biochemistry sleep circadian-rhythms or ask your own question. What causes REM atonia to be lost in sleepwalking? What causes humans to be sleepy? What is the cause of singularity in phase response curve of human sleep and bright light? What is happening physically when I get sleepy and when I wake up?